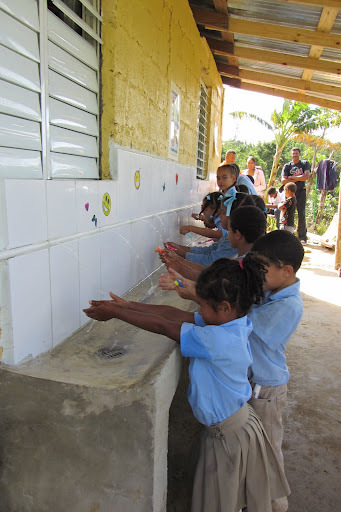 An essential part of Bocas Sanas’ work is to set up a school-based hygiene system: children brush their teeth once a day in specially constructed facilities at school, and wash their hands beforehand. This is done according to the Fit for School system. Curative care should be considered as emergency care, which solves the problems for the moment, but does not give lasting results. Much more effective, and sustainable, is to prevent. (See research carried out by E.J. Kay & D. Locker, 1996, Is dental health education effective? A systematic review of current evidence. Community Dentistry and Oral Epidemiology 1996: 24: 231-5). Twice a year a tablet of Albendazole against worms. In this way, a number of oral, parodontal and intestinal diseases – including diarrhoea – can be prevented effectively and inexpensively. This also prevents the consequences of these diseases, such as pain, malnutrition, and absence of school and work due to illness. When setting up a brushing facility at a school the existing facilities will be used as much as possible. However, the situation can vary considerably: sometimes a wall and roof will have to be made, sometimes a water supply system; in other cases, both are already present. 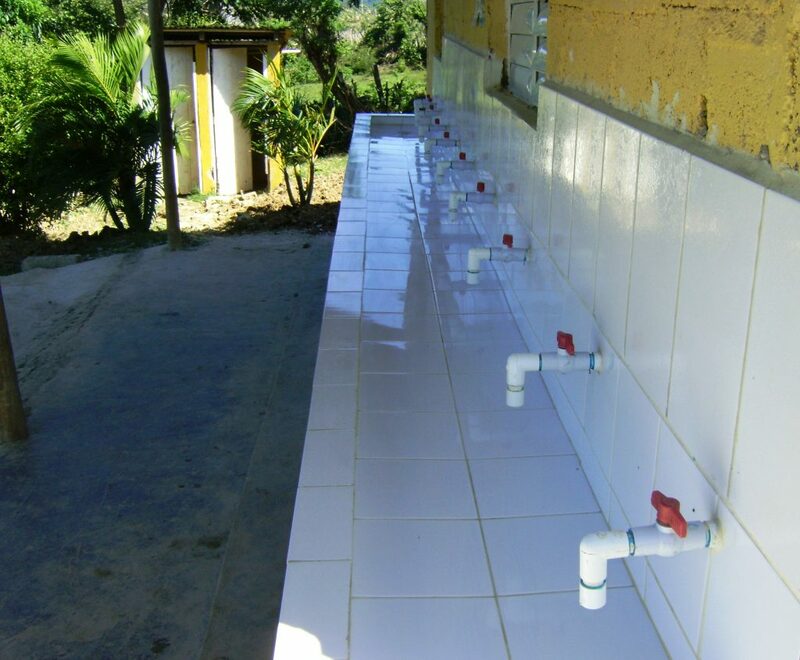 The size of the school – the number of students – also is of importance: for smaller schools a lesser facility with a smaller sink and fewer faucets will be adequate. The experience with the first brushing facilities has taught that in the Dominican Republic it pays to invest in material of reasonable quality and in using professionals for building the facility. Parents can help with the construction, but rarely are skilled enough for adequate carpentry, masonry, tiling and plumbing work. That is why Bocas Sanas has decided to use professionals to build the facilities and use materials that meet minimum standards. In addition to construction costs, the cost of preparation and post-construction monitoring must also be taken into consideration, especially in terms of transport for multiple visits to the school. Informing on the importance of oral hygiene and school brushing, and on concept and functioning of the brushing facilities, as well as gauging of interest of the school management and staff in participating in the program and gathering of basic data about the school. In case of sufficient interest, more extensive consultation and making of arrangements with the school management, teachers and parents, and consultation with and obtaining approval from local authorities. The agreements made with the school management, parents and teachers are aimed mainly at ensuring that the brushing facilities will indeed be used after their completion, and that schools and / or parents themselves take responsibility for buying toothpaste and new toothbrushes. Supervision of construction, to assess whether everything is being done as planned, and take corrective action if and when necessary. After commissioning, three to four monitoring visits are made to check on the use of the brushing facilities, to discuss and address any arising problems, and to ensure the correct use of the installation by continuing the tutoring on correct tooth brushing and hand washing. Prior to the selection of a school for the construction of a brushing facility the school has usually been visited by a Dutch volunteer team. During such a visit inventory is made and recorded of the oral health of all children. Identified problems are solved on the spot or referred to specialists, whereas the recorded data is used to determine the starting situation of the project intervention, so the effect of the intervention can be assessed by subsequent measurement, e.g. one year after commissioning the facility. Preparation and guidance before, during and after the construction of the brushing facilities is carried out by Bocas Sanas founder and chair woman Cristina Doorman-Vasquez, who resides in the Dominican Republic every year, from September to May. When determining the costs of a school brushing facility, all phases of the process are taken into consideration. So not only the cost of the actual construction, but also the preparation and maintenance, which mainly consist of transport costs. The average cost of a cleaning installation, with preparation and supervision afterwards, is approximately € 1100, of which about € 500 accounts for material and € 350 for specialized labour. For a water supply system it may be necessary to add another € 600. For a detailed cost overview and further information please contact us! Bocas Sanas is a foundation aimed at promoting the oral health of youth in the north of the Dominican Republic, in the countryside of the province of Puerto Plata.